We are loving this set. Easy to move around yet does not blow over in wind. 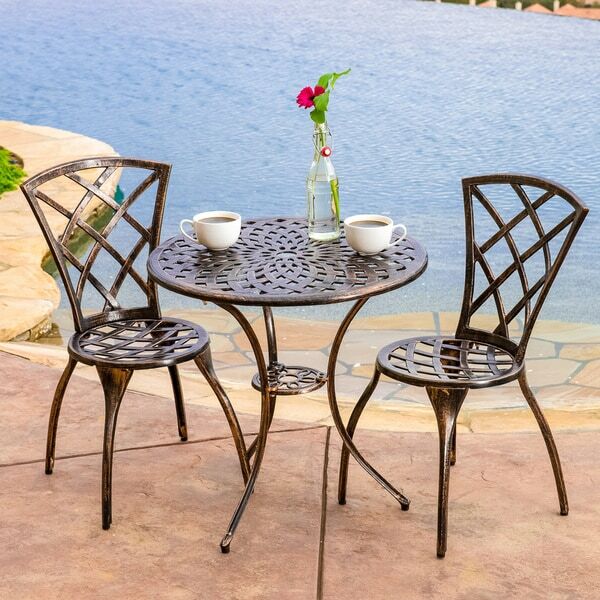 Complete your back patio with this bistro set. The detailed metalwork and gorgeous bronze finish lend texture and elegance to your traditional space. Surround this table set with potted roses and terracotta to highlight the organic qualities of the woven craftsmanship. Nice looking table however not sturdy. If you are over 150 lbs don't buy this table you will be disappointed. I needed a small patio set for my clients to use when they are waiting to get in to see me. This one is perfect for my outdoor space. I will also be ordering an umbrella and base for it and can't wait to see the whole thing together! Definitely recommend this set, especially for the price! Very pleased with the bistro table and the cushions. Table is well constructed and complete set was assembled within 30 minutes. Highly recommend it to anyone on the hunt for sturdy patio furniture. I purchased this to fill in a gap on the patio in an area that is not actually used. I was simply looking to create a visual effect. It is a pleasing design, but I was expecting a slightly better quality. Fortunately, no one will actually use it to sit at because the chairs are not very comfortable for more than a few minutes. I don't have a lot of patience when it comes to assembling things, so I forfeited it of to my handyman. Considering the cost plus paying to have it assembled it really wasn't a bargain. Having said that, coupled with the quality, I have to say it was a bit overpriced - but adorable! I needed a bistro size for my atrium. This is perfect for the space and looks great with the fountain I have. I like that the chairs have levelers. Not as "cheap" as I thought it would be for the price. It's really sturdy. As always, the Chinese instructions on how to put the pieces together weren't everything one would want, but not as bad as they could have been. Chairs were very easy to put together. The table took a little more effort. Definitely need more than two hands. This is a great table for our outdoor deck. There is plenty of room to eat, do work or just sit with a drink. Very happy with this bistro set. We ordered two for back porch. Really like the color and stability. I would recommend this set.. I think it's funny that the complainers are unhappy that this set is not as sturdy as they would like. Soooo what were you expecting for $*? This is an attractive and functional bistro set and with seat cushions the chairs are quite comfortable. I wouldn't let anyone over 175 lbs sit in the chairs, however. Overall, I am quite satisfied with this set. We wanted a small bistro set for our front porch. We were looking for a bronze color and couldn't find one locally. This one was exactly what we wanted, so I ordered it. It came very quickly and wasn't too hard to put together. It's a very attractive set and we have gotten many compliments on it. Very happy with this purchase! I liked the design since I was giving this to a friend who doesn't like fussy designs. Once the item arrived I was very dissapointed with the quality. It is very flimsy and just feels cheap. Very lightweight and would be afraid to leave it out year round for fear it would absolutely fall apart. Arrived promptly, was easy to assemble. Wth all the small parts mounted on a vacuum-pack card, including a mini-screwdriver and -wrench, would not have even needed my own tools had I not had any. Instructions were well written and keyed to the part labels on the card. Table and both chairs were up and usable within about an hour. The table and chairs are a little on the flimsy side. A bigger person may not want to use them. I am not disappointed by the overall appearance of the set, but it wasn't quite what I was expecting. The colors are a little bland compared to the photos here. One of our chairs had a defect that made it impossible to put together out of the box, we have to borrow a tool to grind down the excess metal in the way. Assembly was otherwise easy but there are an awful lot of flaws for the price. I definitely could've done better! I love the Bistro set!! It was easy to put together too. Solid and great price. Little more copper toned than in pic but looks great. LOVE BISTRO TABLE & CHAIRS!!! Takes a while to put together but great instructions & they even put in extra hardware. Looks wonderful on my front porch. Very cute! Took me only about 30 minutes to put everything together, super easy to do. They’re perfect for where I want them! I only gave 4/5 stars because they’re a little more delicate which is fine for me and my mom, who are petite, but for anyone larger they may not be the most sturdy. Great product, great price and easy to assemble,just what I was looking for ,it fits into my front courtyard which is warm and toasty when the other areas in the rear of my home is cooler , besides i am now able to enjoy my great view from the front of the house , which is the best. Easy to assemble and very sturdy. 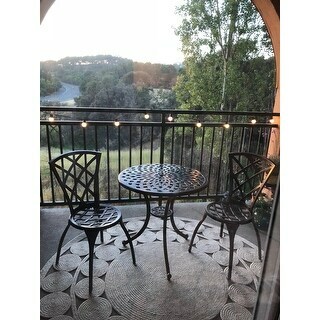 I am loving my patio set. An excellent bistro set. The chairs are a little uncomfortable but seat cushions make it perfect! Yes, I would recommend. It was reasonable and functions well in a small courtyard area or balcony. We love this set, sturdy and nice looking.use it on the patio obviously, the sun does not seem to be fading them out. Still as sturdy and same color as when first got it last year. Adorable little patio set! Perfect with the 2 little beige cushions! Not as solid as I would like, a bit light and could blow in the wind. This set looks so cute on my front porch. It has to be assembled so it is not solid pieces, however, it does not look cheap. It looks great for the price! "Any recommendations for 1) a weatherproof cover and 2) umbrella"
"I really liked the set. One rubber tip for the chair was missing. How can I get a replacement?" "How much does this set weigh?" the shipping weight is approximately, 35 pounds. "Hello. Can you tell me how much the chairs weigh? Thank you!" Hello Jackie, each chair is approximately 10 pounds. Thanks for shopping with us! A.S.
"I've lost a few of the screw-in levelers to the chairs....can I purchase some replacements?" Hello, steve92. Please contact customer care by following this link for assistance with more information regarding this item: https://help.overstock.com/app/contact_page . Thanks for shopping with us! l.b. "Would I be able to order additional chairs for this set?" Hello nlni, unfortunately, we do not sell individual chairs to this set. Thank you for shopping with us.